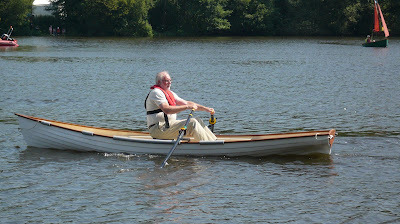 I'm not a big fan of fibreglass as a rule and there were several 'rowing' boats at the Beale Park Thames Boat Show that confirmed my prejudice. Great lumpy things designed to withstand being hired by trippers who play dodgems with them while hurling empty cans of Special Brew at each other. Yurgh. But the Heritage 15 skiff is a different animal altogether. Slim and elegant, the hull has an inner liner that gives a nice inside finish, not just the rough side of a grp layup. And the gunwales are real wood, so it looks dead smart. 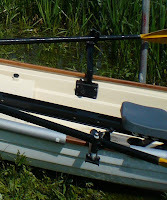 An interesting feature is the swinging outrigger, designed to avoid clashes with pontoons. The arm rotates in a hole in the gunwale, so you can swing it inboard when coming in to dock. On leaving, you simply swing it out until it can go no further and tighten a clamp to hold it in position. The riggers can be lifted out of the pivot holes in a trice when putting the boat on a trailer or on top of the car, which should make transportation very much easier. Out on the water the boat was easy to propel and tracked nicely, but was easy to maneouvre too. Here's a picture of me taking a swift turn right at the end of the lake - see how bendy the oar is. I liked the boat a lot, and at just under four grand with the teak finish, not absurdly expensive. The Heritage range is made in America and imported by The Rowing Company in Falmouth. I own a Heritage 15 and after 6 months of daily use I have concluded it is a piece of junk. The attachment of the seat to the hull (or lack thereof) is laughable. The bench seat to which the slider is anchored rests only on (4) 1" x 1" minicell foam blocks that are bondo-ed to the foam core of the seat. That didn't last long. Within a week the seat was grinding into the hull. The liner of the boat to which the stern end of the slider apparatus is anchored, cracked all the way through after 3 months! These failures are entirely due to poor engineering and sloppy and cheap construction. The company has been extremely evasive and the owner doesn't return calls. STAY AWAY FROM THIS BOAT AND THIS COMPANY!! This is Bill from Little River Marine. I just came across your comment a few minutes ago. I'm very sorry to hear you had problems with the boat and with contacting me (I was out of the state for 3 months in summer of '09). Please call me at (352) 378 - 5025. I'd like to make this right. I bought an 11 year old used Heritage 18, and I am very happy with the quality of the design & construction. It also has teak trim and I get a lot of compliments on the appearance. I hope Bill at Little River was able to resolve Juniper's problems. Hola, hace 5 meses que compré un Heritage 15. Es un barco precioso. El mio combina fibra y teka, com el de la foto de Bill pero sin madera en el espejo de popa. EStoy contento aunque incorporaria mejoras para navegar en el mar: quizás un poco más de quilla ya que la corriente y el viento le hacen derivar bastante, a pesar de que tiene francobordos bajos. Posiblemente con un poquito más de manga sería más estable (menos veloz). Es una nave que se sitúa entre una canoa y un bote auxiliar, ni uno ni otro. Se nota que los constructores han competido pues el barco está hecho al límite; muy ligero, tan solo 50 kg. Es un barco para cuidar mucho, evitar choques y uso brusco, aunque en mar abierto le puedes dar toda la caña que quieras. "Every time I look at it, I feel happy": esto que dijo algún propietario lo siento yo también. Aunque un animal delicado, es una maravilla !!! Crea adicción !!! Hola Jose - es bueno saber que usted disfrute de su Heritage 15. ¿Dónde suele fila su barco? Si me envía unas fotografías voy a publicar en mi blog. Hola Chris. Tengo el Heritage 15 in the Mediterranean Sea, at the Balearic Islands (Mallorca, Spain). Right now I do not have a picture in hand, but I will send you a couple of them next week. Northeast wind is blowing this weekend and I am like a bird in a cage.......with my Heritage waiting patiently for flat... or not very rough sea. Hasta la semana que viene !!! Good weekend !! !